New Hampshire is known for its marvelous downhill skiing. Yes, we are very proud of this, BUT there are many other winter outdoor happenings. Let me share some of the activities where my family and friends were participants, such as a sleigh ride in the great north woods of northern NH, cross-country skiing, a moonlight snowshoe hike. And more. Other times we are observers enjoying the excitement of watching ice climbers scale a mountain side of ice near Crawford Notch with views of the snow-capped 4,000 footers of the White Mountains Presidential range. And more. Below are two videos. The top video is 12 minutes and gives a taste of 14 NH winter happenings. The bottom video is 41 minutes and is being shown by Bedford Community Television (BCTV). I created the top video (12 mins) from key elements from the BCTV video. 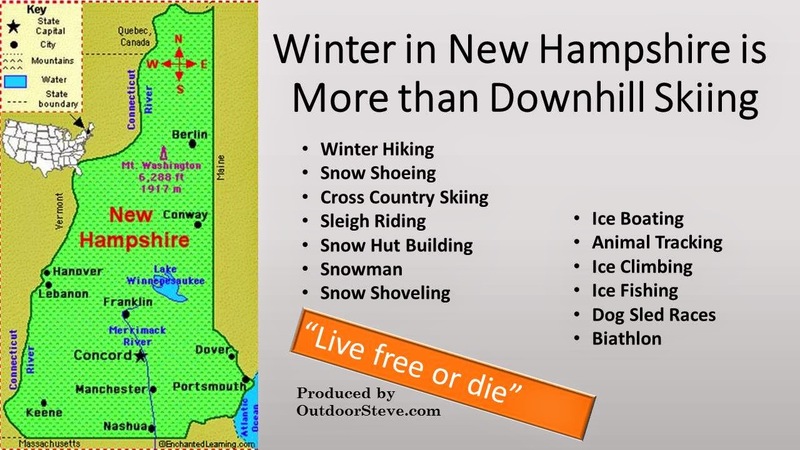 Grab your favorite wintertime beverage, relax, and enjoy as Outdoor Steve presents his first-hand and personal insights of a multitude of New Hampshire winter activities. Never say, "I wish I had enjoyed winter in New Hampshire". "Everyone must do something. 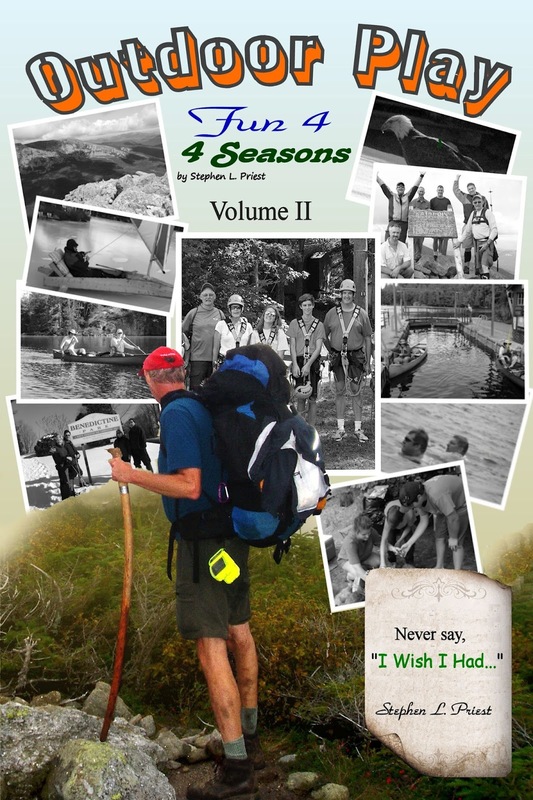 I believe I will go outdoors with family and friends"
Steve's 5th book, Outdoor Play Fun 4 4 Seasons Volume II, is now available (2016). Outdoor Play Volume II has trip preparations, routes, and narratives of bucket list places to go. The book will motivate friends and family to make the outdoors a key component of their daily life. If you want 5 or more books signed, send Steve an email send Steve an email and we can work out the logistics. Outdoor Enthusiast provides outdoor places to go and things to do. Steve's mission is to motivate and encourage families and individuals to make the outdoors a key component of their daily life. Readers are encouraged to post and share their Comments. When trying to explain my enthusiasm for outdoor actions, I paraphrase Thoreau's, "Discover I had not lived" with the expression, "Never say, 'I wish I had'." The book provides places to go and things to do, but moreover the author’s stories and “I wish I had…” show individuals can, like the author, overcome self-made barriers and obstacles of health, physical, mental, and injury problems. My outdoor pursuit began after a torn Achilles tendon, a resultant limp, and weight gain. I turned to physical activity in search of a stress reliever as well as a "lifestyle for the long haul." My writings on 'Outdoor Play' enthusiastically portray the entertainment of the outdoors. Travel with me and meet the challenges of outdoor recreation that are the cornerstone of my lectures and stories. I reside in Bedford, New Hampshire with Catherine, my wife. We have two sons and two grandchildren. If you're interested in having me speak, you can email me at steve@outdoorsteve.com or visit www.outdoorsteve.com.